During the two days of festivities on March 23 and 24, visitors will be able to experience unique culture and traditions of Singapore, as well as viewing several art installations. 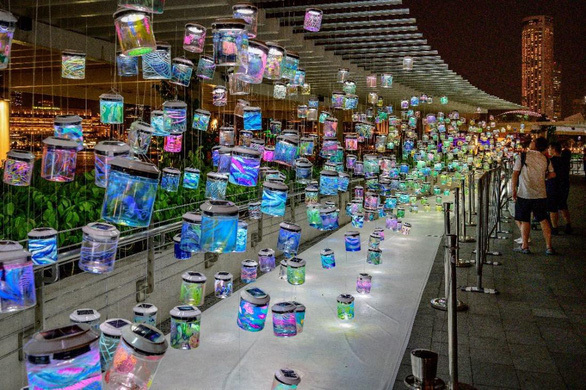 Standing out among the installation artworks at the event is the Rainbow Connection, a display of solar light modules in hundreds of upcycled plastic polyethylene terephthalate (PET) containers suspended in the air. The modules come together to form a canvas of light that explores the fantastical dreamscape of the deep sea, the woods, and the clouds. As the modules gently rotate and sway in the wind, the sculpture seems to come alive with shifting shadows, projecting the imagination of the creator. Especially, the light units are made from some 800 upcycled cookie containers, including 600 new ones decorated by people in Hanoi and 200 containers that were used to during a Rainbow Connection show at i Light Singapore, a sustainable light festival that took place in the city-state in Jan-Feb.
Not only the Rainbow Connection, most of the artworks to be featured at the Singapore Festival in Hanoi will utilize sustainable materials or recycled and reused materials, thus embodying and advocating the importance of sustainability, according to the organizers. 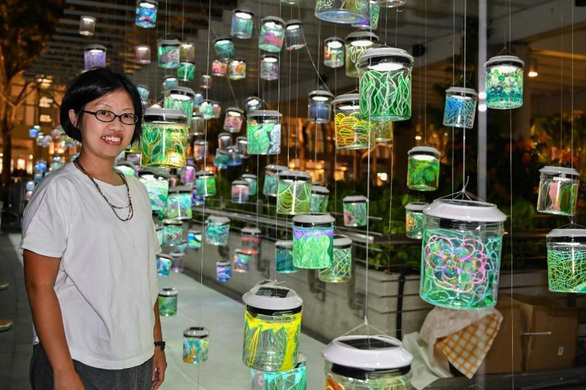 “In my opinion, this is a practical and creative way to help children understand more about Singapore’s unique culture and art,” the mother added. 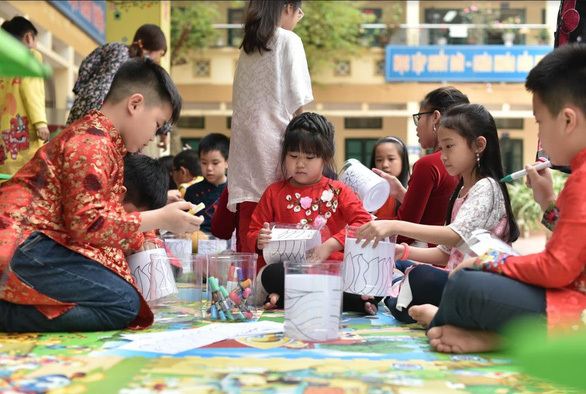 Students at an elementary school in Hanoi paint cookie containers to help create the Rainbow Connection for display at the Singapore Festival. The Rainbow Connection light show is designed by Singaporean industrial designer Lee Yun Qin, also known by her artist name Yun, who previously enthralled visitors with her light art installation Moon Flower at i Light Marina Bay 2017. 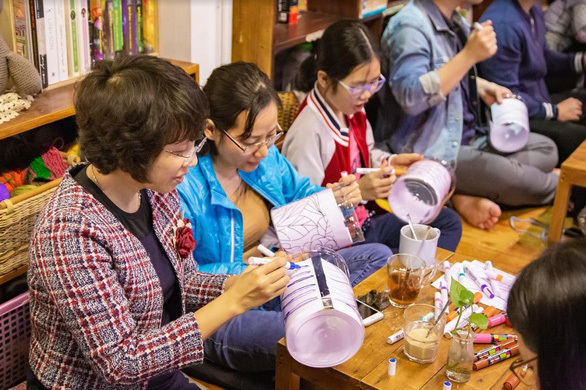 In addition to art installations, the Singapore Festival in Hanoi will amuse visitors with cultural performances, movie screening, and Singaporean ethnic fashion show. They can also experience Singaporean cuisine at booths run by Michelin-starred restaurants and hawker stalls typical to the city-state.